Create a classic bathroom statement with the traditional 3 outlet shower package, brings substantial elegance to the bathroom. The triple valve enables you to select body jets, fixed shower head or shower handset for a quick freshen up or for a real drenching. Suitable for all types of plumbing installation this shower valve has the added safety benefit of a built in anti scald device should the cold water supply fail. Separate controls for temperature and flow. Operates two shower accessories separately or simultaneously and diverts to a third option: fixed head & slide rail kit, fixed head & body jets or slide rail kit & body jets with option to divert to a third option. A perfect solution for today's bathroom, providing style and functionality. 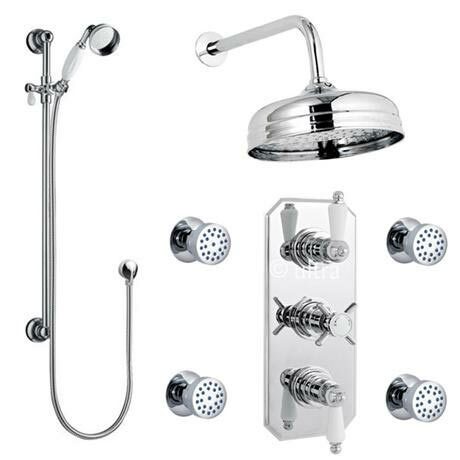 Give your bathroom a touch of style and sophistication with the Traditional 3 outlet shower package. It evokes the design of a bygone era yet has been built to the same high standards contemporary manufacturers can provide. The interior is made from brass making the entire body strong and durable to withstand the daily uses of the bathroom and the exterior has been finished in polished chrome for a touch of elegance and beauty. Attractive face plate with crosshead and lever controls. Q. Hi, I notice the centre tap on the valve is different from the centre tap on part number A3035. Is it possible to buy this set with the tap from A3035?